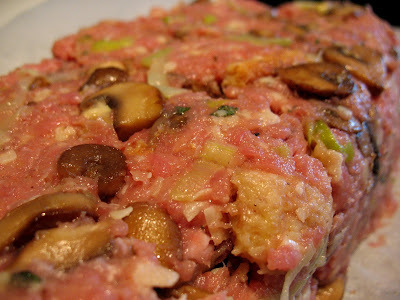 I've never been a fan of meatloaf. For some reason, it just has never appealed to me in any way, until...UNTIL I saw this recipe, and began to wonder. Hmm. 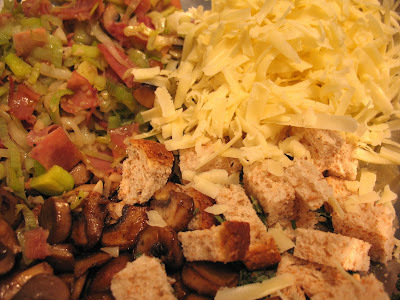 There's mushrooms, fresh sage from my herb garden, leeks, and even cheese, so maybe, just maybe it will be good? Oh MY. It was not just good, but it took some serious self restraint not to just sit down and tuck into the entire thing because my kitchen just smelled like heaven. The original recipe was from the September 2009 issue of Every Day Food, but I did make some changes that are noted below. Pre-heat your oven to 350 F, and line a rimmed baking sheet with parchment paper. In a skillet, saute the mushrooms in 1 tbsp of oil in batches until they are a deep golden brown. Transfer to a large bowl. When you are finished with the mushrooms, saute the leeks and garlic over medium heat until soft. Add the prosciutto and continue to saute for about 3 minutes. Transfer to bowl with the mushrooms and allow to cool. When your mixture is room temperature, stir in the cheese, cubed bread, sage, and an egg until well combined. Mix in turkey, 1/4 tsp pepper and 1/2 tsp of salt. I found it easiest to just use my hands to mix. Then shape the meat into a 10 inch loaf on the baking sheet. Bake about 45-55 minutes until cooked through. Allow to rest 10 minutes before serving. Makes one 10 inch loaf, that would serve 4 people easily. I served it with mashed potatoes and corn on the cob. 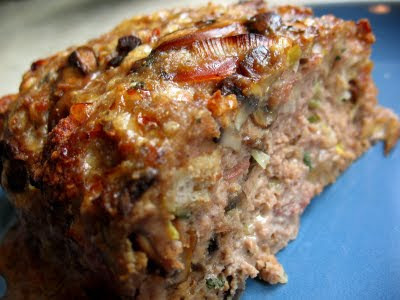 Hubs and Jake loved it, saying that they weren't sure about meatloaf either but this one has so much flavor it completely won them over. Guess what we are having for leftovers tonight?